The Italian literary critic Andrea Cortelessa, in his important anthology of First World War Italian poets entitled Le notti chiare erano tutte un'alba (from a verse of Valmorbia by Eugenio Montale saying "The luminous nights were all a dawn"), first wrote about the "posthumous war", meaning the presence of the Great War in the poets who did not fight it. 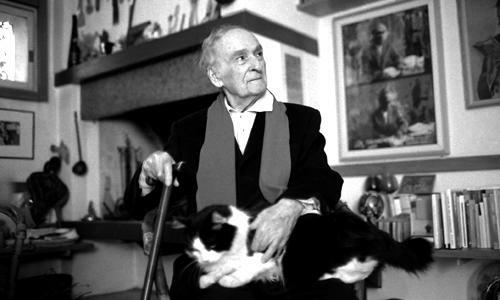 Andrea Zanzotto, probably the most important italian poet of the second half of the Twentieth century, was born in Pieve di Soligo in 1921, three years after the armistice. His village is located in a nice hill landscape on the left bank of the river Piave. It was an area of battles, occupied by the Austro-Hungarian army after the retreat of Caporetto, and is not far from the Montello, a wooded hill that together with the pivoting fulcrum of the whole front, the Monte Grappa, is saldly reknown for being a theatre of bloody battles. In his most meaningful and penetrating work of poetry, Il Galateo in Bosco, published sixty years after the end of the war, we experience the highest example of what Cortelessa meant with "posthumous war". This post is also a tribute to the poet who died only a few months ago, in October 2011, at the age of 90.
il più mistico circo dei sangui. Oh quanti numeri, e rancio speciale. Urrah. dentro i succhi più sublimi dell’alba, dell’azione, in piena diana. E si va.
Mi avete investito, lordato tutto, eternizzato tutto, un fiotto di sangue. Apply to the ossuaries. No ticket is needed. Apply to the headstones. With the most desperate respect. Apply to the taverns. Where heavenly elements await. (see it at every closed window) is for rent. the most mystical circus of bloods. Oh how many, and a special mess. reveille. And off we go. overcrowded with bravura and fear. Freewheeling, and off we go. and never grants them, here holiness begs, acquires). The ossuaries have a factory-like fervor. There one receives orders, eternal ordinations. There one is sorted. raise pigs; trafficking with the ossuaries. You knocked me down, dirtied all, eternalized all, in a gush of blood. in the slender stems of this rain, of the circus, of the game.